Do you stash canned frosting in the back of your crammed refrigerator hidden from the view of family nutrition nazis, ready for a stealth shot of that luscious sugar-high? Do you secretly frost family cakes and cookies with canned confections, embarrassed to publicly confess that you're not Martha Stewart's kindred kitchen spirit? If so, you're not alone. Absolutely no one admits to buying canned, premade frosting, even though millions of the vividly-colored cans are sold each year by grocery stores, WalMart, Target and the like. It seems to make good sense: you're in a hurry, it's 7 pm, and your child needs frosted cupcakes tomorrow for a school party. Whip up the goodies using a quick cake mix; top with vibrantly colored, easy-spread canned frosting... and presto! Time-crunch dilemma solved. Problem is... canned frosting is essentially a chemical concoction, with a long list of ingredients that would confound anyone but a professional food chemist. Certainly nothing your grandmother could identify as a real food, except sugar. Nutritionists consider many of these chemical ingredients to be an unhealthy diet, and a few are downright controversial. For instance, repeatedly ingesting industrial-made foods.... baked goods, wine, cheese, yogurt, dried meats... that contain preservative potassium sorbate can "lead to allergic reactions, nausea, diarrhea and nutrient loss in food," even though the compound is classified as as "non-toxic." "Soybean lecithin comes from sludge left after crude soy oil goes through a "degumming" process. It is a waste product containing solvents and pesticides and has a consistency ranging from a gummy fluid to a plastic solid. Before being bleached to a more appealing light yellow, the color of lecithin ranges from a dirty tan to reddish brown." Modern Industrial food corporations use chemical ingredients in canned frosting, rather than real dairy products, fresh fruits, and organic sugars, in order to manufacture a cheaper product with a long shelf-life. And to make the product more generically pretty, per focus market-test groups. The answer for your midnight frosting cravings, or for topping last-minute home concoctions? Know what you're eating by reading labels and researching ingredients. Don't regularly consume or serve Pillsbury Creamy Supreme Strawberry Frosting, or any other canned, industrial-made frostings. My friend, do you realize that scrumptious, homemade frostings can be whipped up in mere minutes? The most famous, and perhaps most popular of all cake frosting recipes... Betty Crocker's buttercream frosting... uses only four ingredients: milk, butter, vanilla and powdered sugar. But as with all vices of pleasure... if you must, you simply must. Enjoy your canned frosting indulgence. Just do so sparingly. ...sludge left after crude soy oil goes through a "degumming" process. It is a waste product containing solvents and pesticides and has a consistency ranging from a gummy fluid to a plastic solid. Good work, Deborah. That's what I call real muckraking. You'll be glad to know that your other message about processed cheese inspired me to make my most recent batch of pimento cheese using only grated natural cheddar, leaving out Velveeta which was half the old mixture. I think my mother used Velveeta to make pimento cheese spread smoother and cheaper. She sometimes put it in the mixer and whipped it to a soft spreadable consistency. It was good, but I always liked bits of real cheese to be in it. Here's the thing: If you actually stop and *think* about what canned frosting tastes like, instead of just assuming that it tastes good because it's pretty, it tastes HORRIBLE! And (as you point out, Deborah) it's so easy to make real frosting. Canned frosting is a tiny little crime against humanity, in my opinion. Also, you should do an expose on juice - I recently bought some Tropicana "100% Apple Juice." When I opened it, it smelled like green apple flavored Jolly Ranchers candy. I looked at the ingredients: apple juice from concentrate, artificial and natural flavors... Apples don't taste apple-y enough, so they have to put in artificial flavoring? I was so disgusted. Keep up the good work! This topic is so important! That's the sad thing. Too many people's idea of a flavour is the artificial one. Oranges do not taste like orange soda and I do not know any fruit that tastes like "fruit punch". Expectations have to be reversed. A person should taste a Jolly Rancher and think "Well this sort of tastes like fruit. I really want the real thing now. Please hand me some grapes." John, I'm thrilled that you were inspired to make your own, using only grated natural cheddar and leaving out the fake food. With the blog, I hope to inspire everyone to do the same. 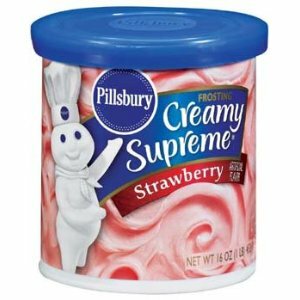 Unknown, I bought a can of Pillsbury Creamy Supreme Strawberry Frosting, to taste. You're so correct... to me, it's disgusting. The sugar-high of the first moment was an eye-popping jolt, but I found the strongly metallic after-taste to be weird and quite synthetic.